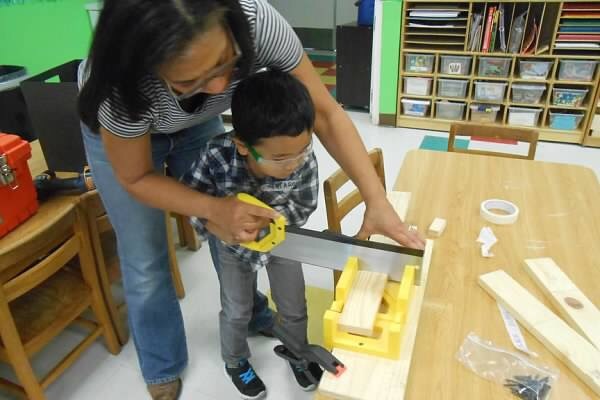 The Maker Movement, simply stated, is about making stuff. It is an effort to regain the DIY (do it yourself) skills that many people used to practice such as making a garden bench or fixing their own toaster. It is about science, technology, engineering, art and math used in creative or practical applications. Makers can be artists creating a moving, fire breathing, metal dragon, or a crafter sewing beautiful purses, a tinkerer building an alarm clock from a circuit board and some LED’s, or an entrepreneur prototyping a new type of drone. Is it important for my child to be able to make things? When kids are making, they get lots of parts and pieces and no instruction manual. They decide what they build and figure out how to do it. By using this approach the children practice the engineering design process, they remember what they learn, and they experience a great sense of accomplishment and pride when they realize they did it by themselves. It gives them the confidence to face and tackle future challenges and a great foundation for their education in STEAM fields (Science, Technology, Engineering, Art, Math).